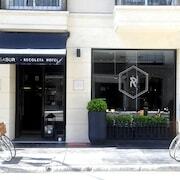 With a stay at Loi Suites Recoleta Hotel, you'll be centrally located in Buenos Aires, steps from Recoleta Mall and N. S. Pilar Parish. 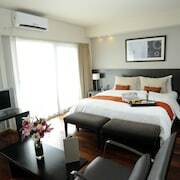 This 4-star hotel is close to Teatro Colon and Obelisco. 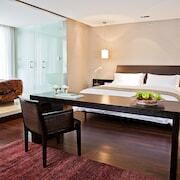 Make yourself at home in one of the 112 air-conditioned rooms featuring minibars and LED televisions. Complimentary wireless Internet access keeps you connected, and cable programming is available for your entertainment. Private bathrooms have deep soaking bathtubs and complimentary toiletries. Conveniences include phones, as well as laptop-compatible safes and desks. Don't miss out on the many recreational opportunities, including an indoor pool, a sauna, and a fitness center. Additional features at this hotel include complimentary wireless Internet access, concierge services, and babysitting/childcare (surcharge). Grab a bite at one of the hotel's 2 restaurants, or stay in and take advantage of room service (during limited hours). Quench your thirst with your favorite drink at a bar/lounge. A complimentary buffet breakfast is served daily. Featured amenities include a business center, express check-in, and express check-out. Planning an event in Buenos Aires? 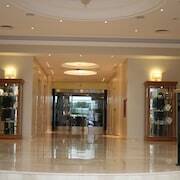 This hotel has facilities measuring 118 square feet (11 square meters), including meeting rooms.